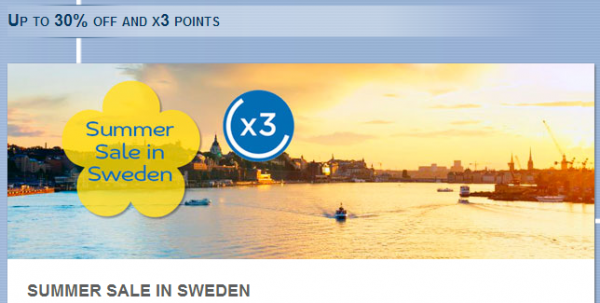 Le Club Accorhotels members can earn triple points and get up to 30% off for their stays in Sweden between May 5 and July 31, 2014, at participating hotels. The offer is valid for bookings made at least 14 day in advance and the offer is valid for stays at Novotel hotels until June 30. Note that you will also receive a breakfast buffet at all other brands except Ibis. If you are heading to Sweden in May, June and July, you probably should check out the prices under this offer that offers also triple points. 1. General Le Club Accorhotels terms and conditions apply to the ‘Summer Sale in Sweden’ offer. 2. This offer is valid for any ‘Summer sale in Sweden’ stay done between 05-05-2014 and 31-07-2014 at Novotel for stays until 30-06-2014 in one of the participating hotels, and booked between 21-04-2014 and 30-05-2014. 3. This offer entitles Le Club Accorhotels Loyalty members, regardless of their status, to benefit from earningtriple points in one of the participating hotels in Sweden. 4. You must book your stay ahead of time on-line to benefit from this offer (www.accorhotels.comor brands.com) or via our Accor call centers. 10. This offer can be used only three per member during its validity period.